Many power-generating boilers–cyclone fired, refuse, fluidized bed–use refractory inside the furnace and burner area to protect the boiler tubes from the severe environment created by the burning fuel (coal, refuse, wood). 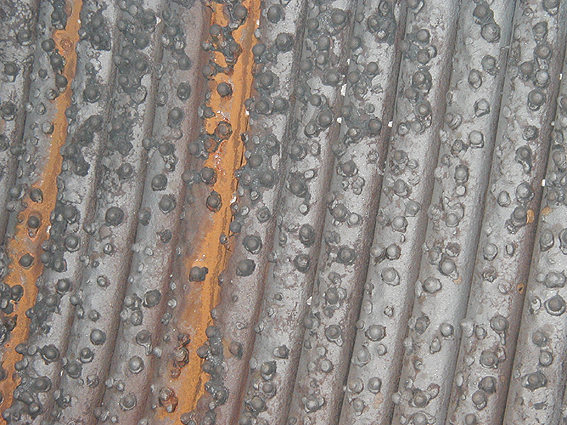 The boiler water wall tubes are pin-studded tubes. The pin studs help retain the refractory at the tube wall surface and cool the refractory surface. The refractory material, in turn, protects the water wall tubes and pin studs from the combustion and environment created by the fuel being burned, and it keeps the boiler operating efficiently by its resistance to slag and ash. When the material was selected, no one took into account the chemistry and corrosive nature of the ash and slag. Finding the root cause of a refractory failure requires several pieces of information. You need to have a refractory material sample for testing and know how and where the material was stored, and for how long. You also need to know when the refractory was manufactured, exactly when the refractory material was installed (in order to compare ambient air conditions), how much refractory material there was, and how it was installed. Finally, you need information on the curing and dry-out procedures that were followed (or not followed), and the chemical analysis on the fuel (coal, startup oil, refuse, wood), ash clinkers and slag. Slag is the formation of molten, partially fused or resolidified deposits (ash) on the boiler or furnace wall. Slag is a function of deposit temperature and deposit composition. Boilers, for example, are designed to maintain ash in a fluid state. The temperature of the ash leaving a boiler can reach up to 2400 F. Deposit composition is a function of the local atmosphere, particularly for ash with significant iron content. Slag deposits on boiler walls reduce furnace heat absorption, raise gas temperature at the boiler gas exit, cause fouling in the convection or heat recover area of a boiler, cause an increase in the attemperator spray flow, and interfere with ash removal. Air and fuel imbalance (stoichiometry) can also cause slagging, especially when the coal has high iron content. In order for slag to adhere to a clean surface and form deposits, the particles must have a viscosity low enough to wet the surface. Iron raises all four values of ash fusion temperatures (initial deformation, softening, hemispherical and fluid). Therefore, the greater the iron content in the ash, the greater the difference in ash fusibility between the oxidizing and the reducing condition. The amount of slagging will also depend on what type of coal is being used. For example, a bituminous coal causes low to medium slagging and has more iron oxides (FeO3) than the sum of the calcium oxides (CaO) and magnesium oxides (MgO). A sub-bituminous coal (powder river basin or PRB) causes high slagging and has higher moisture content than a bituminous coal. A lignite coal causes severe slagging and has more calcium oxides and magnesium oxides (CaO + MgO) than FeO3. Due to the surface porosity of the refractory, slag can penetrate and cause the deterioration of the refractory surface. To prevent this corrosive attack and give longer life to the refractory surface, you can form a "frozen" layer of slag between the refractory surface and the molten slag. This thin slag layer can be formed only by the combination of the cooling action of studded tube walls, the thickness of the refractory material and the thermal conductivity of the refractory material. Higher hot-face temperatures are less likely to form a frozen slag layer. Alkalis are found in the combustion of the coal, oil or wood. The most prevalent and harmful alkalis are sodium (Na), also known as soda, and potassium (K) or potash. These alkalis could chemically react with silica found in some refractory materials. Sulfur is also found in the combustion of gas or coal. Sulfur will combine with lime and iron oxides to reduce the strength of a refractory material. In the presence of moisture, the sulfur compounds and salts can form sulfurous and sulfuric acids. These acids could react with the basic components of some refractory materials. Hydrocarbons are found in the incomplete combustion of fuel (ash). Hydrocarbons normally do not present a problem for refractory materials except when there is a reducing atmosphere. When a reducing atmosphere is present, hydrocarbons can react with the iron oxides in the refractory material and form large carbon deposits. These large carbon deposits could eventually cause a chemical spall on the surface of the refractory. Vanadium found in low-grade fuel oil can act as a catalyst forming a low-melting alkali-silica compound that could react and break down the basic components of the refractory material. The temperature to which the refractory material is exposed is also very important. When the operating temperatures are higher than the recommended use-limits of a refractory material, the refractory could melt. 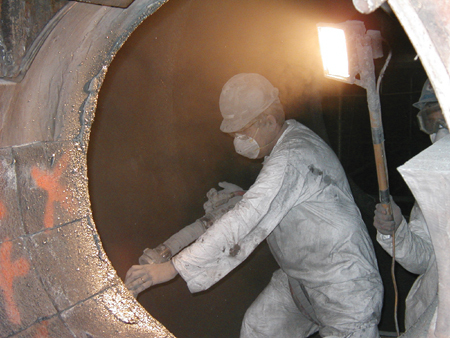 The first signs of excessive temperatures are excessive cracking and glazing on the refractory surface. As stated earlier, when choosing a refractory material, you must take into account the area of usage (such as furnace lining and burner area), application method (gunning, ramming, trowel, pouring or shotcreting), and the boiler environment created by the burning fuel (vanadium, sulfur, potassium, moisture content in the coal, stoichiometry, ash, slag and reducing atmosphere) to which the refractory will be exposed. There are three basic steps to follow for selecting a refractory material: Examine the existing refractory (or the lack thereof), calculate the base-to-acid ratio of the slag and ash, and select the right materials based on the application, usage and boiler environment. Step 1: Examine the existing refractory. When replacing old refractory material, don’t automatically use the same material as the original design called for, or what "you always use." It is better to examine the reasons for failure and adjust the selection accordingly. Ask yourself: Did the material spall due to thermal shock? Has it shrunk due to temperatures above its use limit? Does that gouge in the refractory lining indicate mechanical abuse? If the surface appears "glassy," is it due to operating at temperatures above the use limit? Does the lack of material indicate improper installation? The old refractory lining–whether it exists or not–will offer several good clues. Step 2: Calculate the base-to-acid ratio when ash and slag are present. This will give you a starting point on what type of material to choose. Here is one way to calculate the base-to-acid ratio. The values are taken from the chemical analysis of the ash and slag samples. A base-to-acid ratio less than or equal to 0.25 indicates an acid condition. An acid condition indicates that a SiO2-type refractory should be considered. A base-to-acid ratio greater than 0.25 but less than 0.75 indicates a neutral condition. A neutral condition indicates that an Al2O3, SiC or chrome-type refractory material should be considered. A base-to-acid ratio greater than or equal to 0.75 indicates a basic condition. A basic condition indicates that an MgO or dolomite-type refractory material would be considered. Step 3: Select the right materials. Look at all service conditions-including fuel or raw materials being used-including start-up fuel, ash and slag content, gas temperature and stoichiometry-before choosing a refractory material. Refractory materials vary widely in temperature use-limits, thermal shock-resistance and abrasion resistance. Pick a refractory material with the best combination of properties for your application. Example 1: The moisture content in the fuel can affect refractory materials. High moisture content, or the moisture content in the fuel combined with a reducing atmosphere, can cause a separation of the silicon carbide base material (grain). This separation occurs when the total percentage of the moisture content found in the fuel is greater than 15 percent, or when the combined total percentage of the moisture content in the coal and the reducing atmosphere percentage is greater than 15 percent. Therefore, if the boiler environment were similar to this example, then a high-alumina product would be preferred to a silicon carbide material. Example 2: Certain amounts of iron oxide, potassium, sulfur or vanadium found in the fuel, slag or ash, react with cements (calcium-aluminate). This is especially true when a reducing atmosphere exists inside the furnace. Therefore, if the boiler environment were similar to this example, then a phosphate-bonded refractory material would be preferred to a cement-bonded material. Example 3: Certain startup fuel oils may contain vanadium. 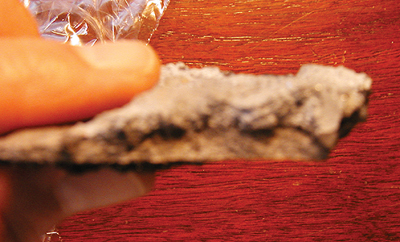 Vanadium reacts with the cements (silica and lime) of a conventional refractory. A chemical spall will occur at the surface of the refractory and will reduce the longevity of the lining significantly. Therefore, if the startup fuel oil were similar to this example, then a low-cement or non-cement refractory material would be preferred. 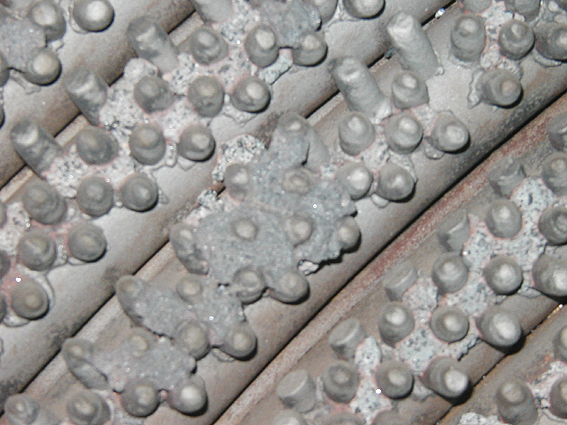 Refractory failure is a major contributor to boiler and furnace shutdowns. Refractory that is properly selected and installed will last longer and help minimize the amount of shutdowns required, leading to savings in annual fuel cost. 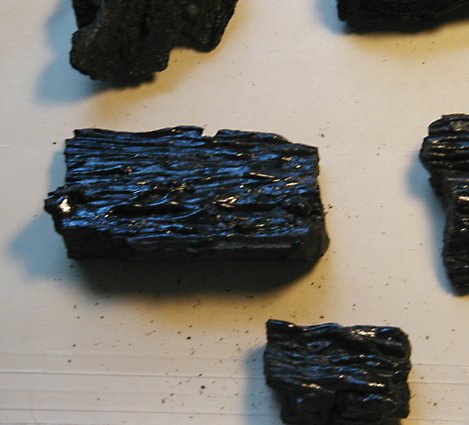 Eliminating refractory failures begins with understanding ash and slag. That is why experts say, "Refractory designed and installed to save energy also saves money at a rate that is essential for efficient power plant operation." Gun application of refractory in a cyclone burner. Boiler tubes with unremoved refractory. Close-up of cyclone burner tubes with unremoved refractory. 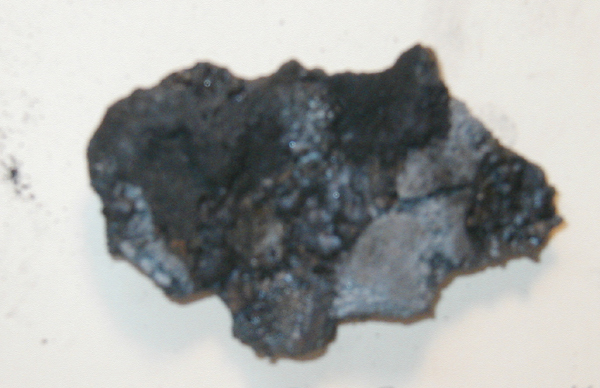 Slag and refractory sample taken from failed furnace lining. 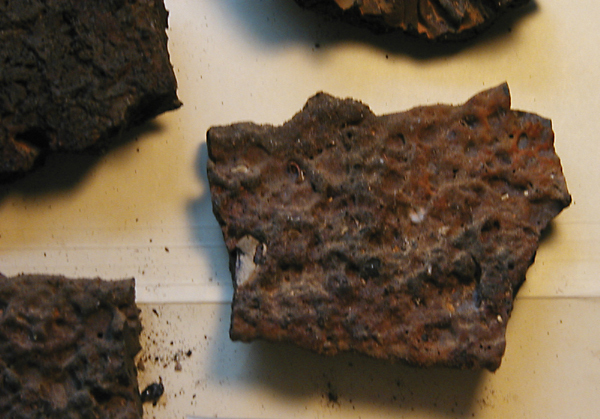 Close-up of slag sample with pin studs, with no refractory material present.